Spring is finally rolling in and I found the perfect DIY to kick start the season! I saw this cute inspiration when I was just browsing through the internet and couldn't resist but recreate the idea for all of you! This is a perfect piece of decor to decorate your room with and can really be customized so that it fits who you are! (You can even customize this for a boys room!) What I loved most about this DIY is that it can be used for all ages, genders and any kind of event! I think this craft would be beautiful as wedding initials of a bride and groom! Oooooo. How excited I get when I think about the endless possibilities there are! Step 1. De-stem the flowers! For most of these fake flowers you should easily be able to pull the flower off the actual stem. If it is too difficult then use your scissors to cut the stem off. I usually try and make sure the base of the flower is as flat as it can be so that it will stick down on the letter. Step 4. 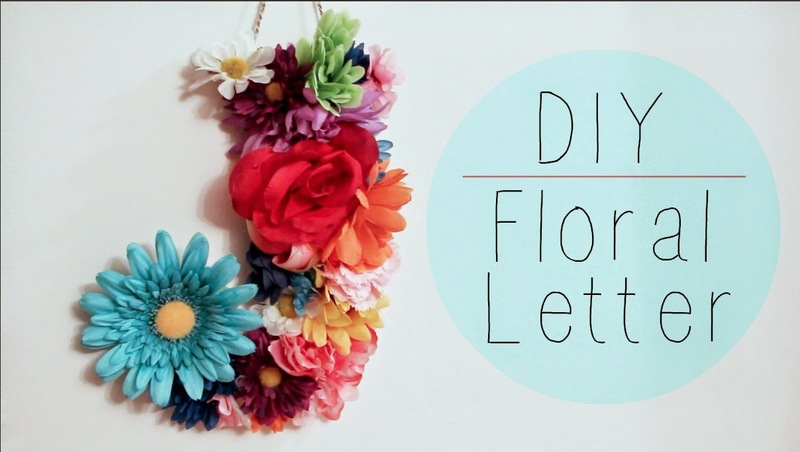 Pre-place your flowers onto your letter before you glue them on. This will allow you to see what arrangements you might like and what you might not like. Step 6. If you are going to be using a string to hang your letter. Cut out three 15 inch strings! To make sure the string won't break I just braided the string to make it heavier duty. Step 8. Hang your letter! I hope you enjoyed and followed along with this little adorable DIY! I think it is so cute and gives a simple personalized touch to whatever space you need. If there are any other DIYs you'd like for me to recreate go ahead and leave them down below or tweet me them @jennsphilosophy!